Drum box allows a step to have an accent. In essence, this is meant to make a step louder than other non accented steps. 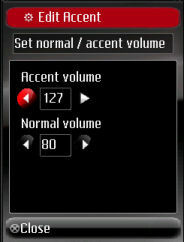 This option allows the accent's volume and normal note volumes to be set. The maximum value that can be given is 127. The accent always appears as the last instrumwent (AC) in the pattern editor.